When you have a sweet tooth as rampantly out of control as mine, you tend to revel in all things chocolate, including Willy Wonka. 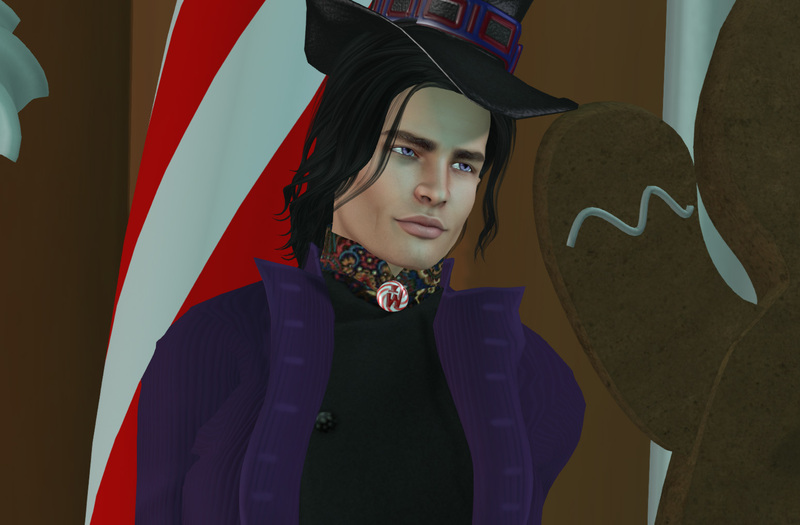 When I first logged into Second Life, one of my friends was even more into the story of Willy Wonka than I am, and that’s saying quite a lot, considering I’ve been known to Cosplay Willy Wonka in real life. In fact, some folks only knew me as “M.W.Wonka” for the longest time. 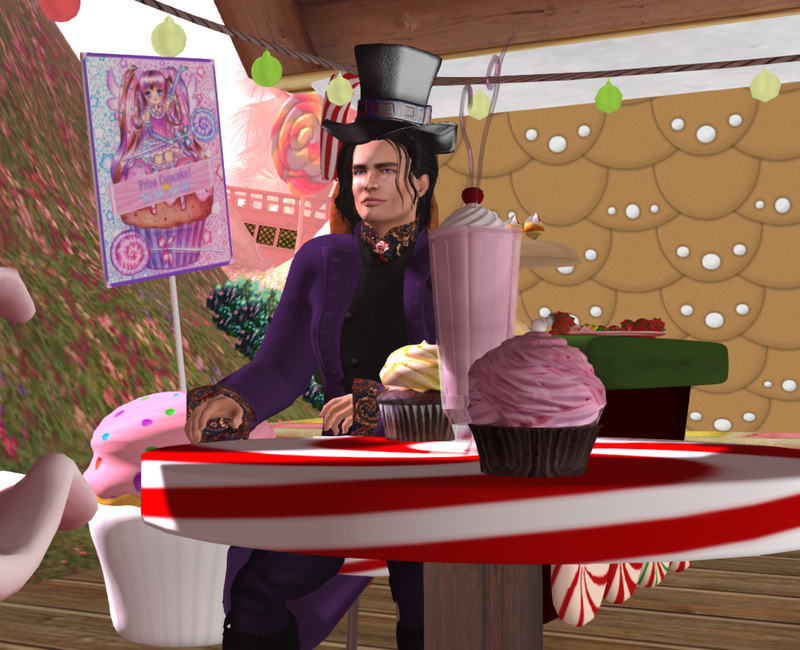 When I first built Avatar Bizarre in Second Life, one of the initial outfits for sale was The Candy Man, a costume inspired by the Johnny Depp version of Willy Wonka. You know, the really creepy one, as opposed to Gene Wilder’s more frantic, chaotic, mildly sociopathic version. Love them or hate them, these men shaped how we think of the character. Naturally, Second Life needed influence from both. Flash forward to a bunch of years later, and Second Life’s creation process has mostly ditched the old system layer clothing to favor mesh. Since I’m still a fan of the books and movies, I decided to let them inspire me for a new outfit. Enter The Chocolatier, an ensemble that is loosely based on the Johnny Depp Wonka. 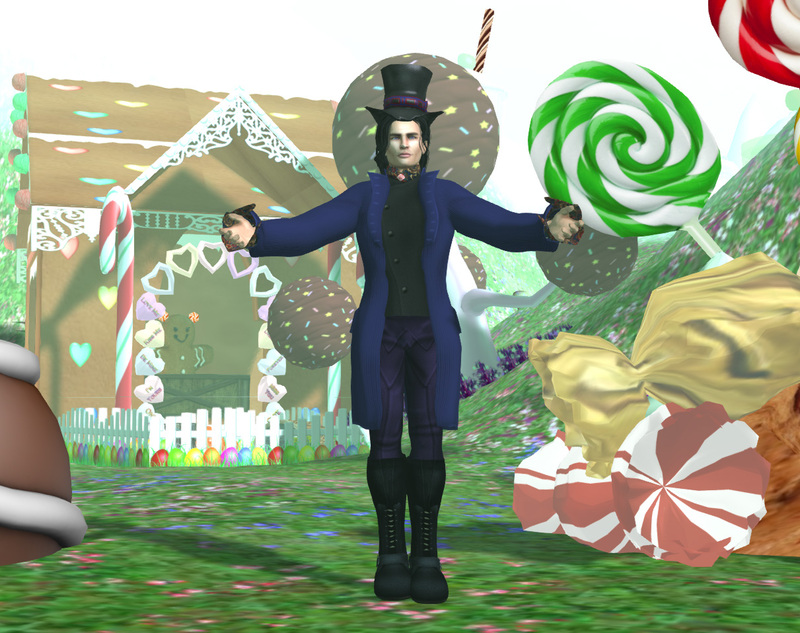 This outfit includes a fit mesh jacket/waistcoat/shirt, a shiny top hat, a peppermint candy neck pin, a cane (with a pose), system pants in six colors, Omega clothing appliers (for those with mesh bodies), and a color HUD for the jacket.